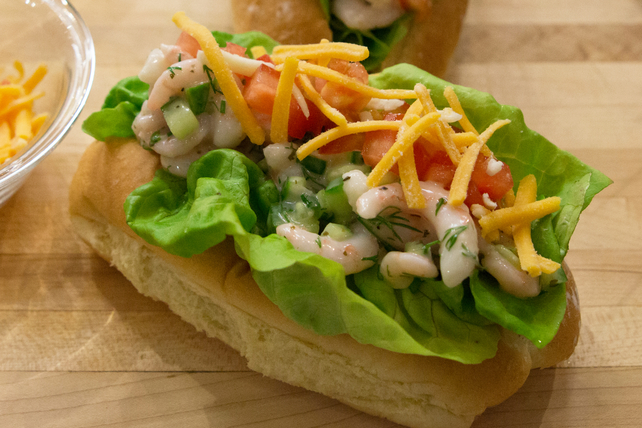 This Net Full of Shrimp Saanich sandwich is a local seafood favourite, brought to life in partnership with KRAFT to celebrate North Saanich, B.C. 's KRAFT HOCKEYVILLE win! Use serrated knife to make lengthwise cut in top of each bun, being careful to not cut through to bottom of bun. Fill with lettuce, shrimp mixture, tomatoes and cheese. Use local cooked cleaned prawns or crabmeat instead of baby shrimp. Substitute 1 celery stalk for the cucumber. Prepare using hot dog buns. Visit Roost Farm Centre for bakery-fresh buns and Michell’s Farm for farm-fresh produce.